On the nose, a first impression of fresh almonds, then yellow-flesh fruit aromas evoking peach and mango; toasted, roasted notes accompanied with dried citrus and pink grapefruit. In the mouth, a lovely aromatic fullness with honey flavours and a smooth chalky texture; candied lemon notes and a delicious bitterness, a wonderfully refreshing finish. The delicate colour and golden hues are a sign of the wine's maturity and Bollinger's wine-making methods. The blend of La Grande Année 2007 is made up of 70% Pinot Noir and 30% Chardonnay. Made exclusively of Grands crus and Premiers crus from champagne, the grapes selected are from the cuvée to keep nothing but the best juice. 14 crus make up the composition of La Grande Année 2007 blend, mainly Aÿ and Verzenay for the Pinot Noir and Avize, Cramant and Oger for the Chardonnay - 91% Grands crus and 9% Premiers crus. "It might seem a bit surprising that Bollinger skipped the great vintage of 2006 for the more modest 2007. For me that choice is however quite logical since the Bollinger house style is much better suited to austere vintages than for fruit bombs. Here we have a classic and perfectly balanced Bollinger with deep layers and beautiful crisp apple acidity. Gorgeous balance between the dark and light as a perfect Ying and Yang marriage. Layers of dry cocoa, hazelnut fudge, dried apricots and juicy red apples dominate over a beautiful hint of forest aromas based on sous bois and mushrooms in the background. One of the three best champagnes from this vintage." La Grande Année 2007 is a must-have for gourmet restaurants and good hotels alike: it is the perfect champagne to serve with a fine meal. To fully appreciate its unique style, bouquet and aromas, La Grande Année 2007 is best served between 8 and 10°C. Enjoy La Grande Année 2007 right away, or choose to age it in your cellar. Foie gras, fresh or pan-fried; Grilled fish, with or without sauce, lobster; Roast lamb or veal; Parmesan or Comté. 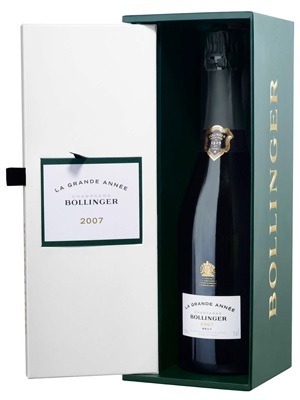 La Grande Année is Bollinger's prestige blend, produced only when a harvest reaches a perfect balance. It is Bollinger's interpretation of an exceptional year, whose virtues deserve to be brought to the fore, and whose quality ensures the continued production of the house's outstanding prestige vintages. During an exceptional year's harvest, grapes solely from grands and premiers crus are vinified to reveal a harmonious blend which portrays the characteristics of a remarkable viticultural year. La Grande Année develops a majestic vinosity, and intense, rich complex aromas, whose tonality varies according to the nature of each vintage. Tasting a bottle of La Grande Année will represent a rare and memorable experience for any wine connoisseur. Vinification of La Grande Année takes place in small old oak barrels to avoid giving the wines any taste of wood or tannins, so that their aromatic complexity and their ageing potential can express themselves to full. It is therefore necessary to start with wines of exceptional quality: that is why the grapes that are used to elaborate La Grande Année vintages are only from grands and premiers crus. After bottling, the refermentation and the slow ageing in the cellar take place under a natural cork to protect from oxidation and to preserve the freshness of the wines, the bouquet and the clarity of aromas. Ageing on lees lasts at least 6 years and often longer. After manual riddling and disgorgement, La Grande Année is given a moderate dosage of 7g per liter and then rests for at least 3 months in the cellar before being sent away, just the time required for the wine to assimilate the liqueur d'expedition and regain its balance. These winemaking choices, rare in champagne, are signatures both of the Bollinger style and their strict standards of respect and quality of the grapes and the wines.